To find out more about taking this program online contact Publications at isee@isee.org or call 440-349-4400. The International Society of Explosives Engineers Certificate Program was developed to educate blasters and establish a standard level of training for the explosives industry. The program is designed to meet the needs of explosives users with varying degrees of skill and expertise. Substantive material is taken from the ISEE Blasters' Handbook (formerly the ETI and, before that, DuPont Blasters' Handbook) currently in its 18th revision. The material in Level I has been revised to include updated and more detailed information. The information has been distilled into interactive online program. A Certificate of Completion is presented upon completion of the program. Lesson 1: Blasting Safety... stresses the importance of field operations safety and focuses on the importance of well-trained personnel; the proper use of blasting materials and equipment; and the correct use of blasting procedures and methods. practices together with basic hole loading procedures and information on setting up and detonating a shot. 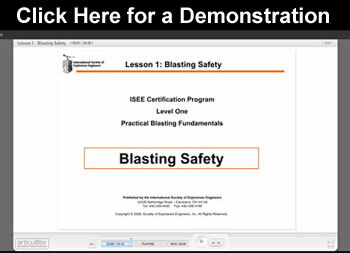 Lesson 4: Explosives Products and Selection... covers the types of explosives and blasting agents used in blasting. The lesson also covers explosives properties and selection criteria. non-electric detonators, detonating cord, primers and boosters, and proper methods and techniques. covered are delay patterns, timing considerations and design guides. and reporting anomalous data. The lesson also stresses effects on structure, human response, regulations and the importance of effective public relations. together with an overview of international regulations.